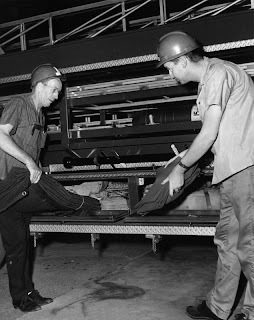 The 2-11 Fire Buffs Association started around 1958. They met the first Wednesday of every month at John C. Lincoln Hospital. They later acquired old station 18. The above picture was taken around October 1962. The people in the picture are from left to right: Bill Kivet, David Branch, Pete Lucas, Matt Kells, Bob Walls and Bob Guildig. Bob Joined the Fire Buffs around 1960. Bob and Matt Kells would Incorporate the 2-11 Fire Buffs Association on June 19th 1967 (bet ya wonder how I know that). 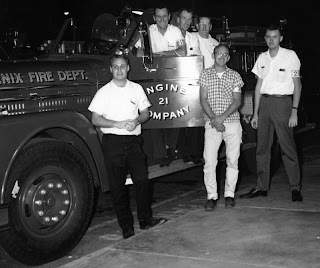 They are standing in front of Engine 21, a 1961 Seagrave sporting a 1250 gpm pump, and a 935 cid Hall-Scott gasoline engine. The engine was not yet in service and was being shown off at various locations as part of "Fire Prevention Week". The above picture was taken in 1963 by an unknown Republic & Gazette photographer. The man on the left is Pete Lucas and Bob Guildig is on the right. This had to do with the remodeling an addition at old Fire Station 9. The rig is a 1961 Seagrave 85 foot tillered 935 cid Hall-Scott. Bob does not remember why they were there. 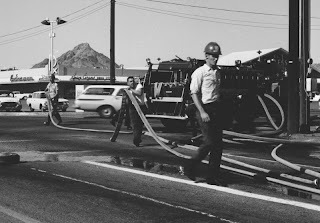 The above picture was taken just after a 2-11 fire at a Yates surplus store (used to be about 2 blocks south of Camelback on 7 ave.). The men in the picture are from left to right: Pete Lucas. Jim Parks and an unknown. Mr. Unknown was later "asked" to resign because of an incident where he passed Ladder 9 going north on 7th Ave from Camelback. At Missouri and 7th Ave he stood in the middle of the street and stopped traffic while Ladder 9 went through (he had done something like this on several occasions). Back then the fire buffs would help clean up after a fire and on many occasions even help fight fires, and act as messengers at fire scenes. Fire buffs could be identified by their red hardhats. You can see this in the picture below of David Branch at another 2-11 fire. 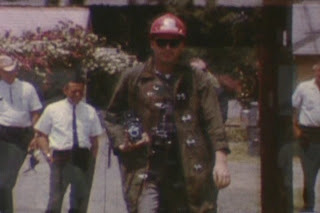 Or this picture taken of Bob from old 8mm film. 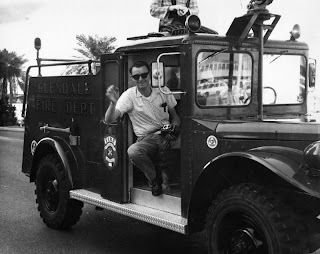 Back then Fire Buffs had unprecedented access to a fire scene that just doesn't happen today. 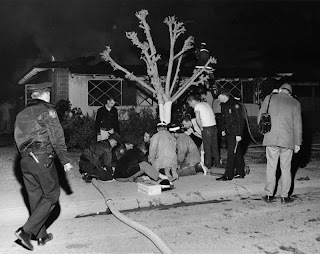 Here we see a picture taken by an unknown Republic and Gazette photographer of a group of firemen attempting to resuscitate a victim at a fire that took place on 01-11-1967 at 4231 w. Citrus. The man on the right with the helmet and black camera bag is of course Bob Guildig. They often appeared in parades. As in this case once again of Bob Guildig. The picture was taken by Gerald Rachwitz. 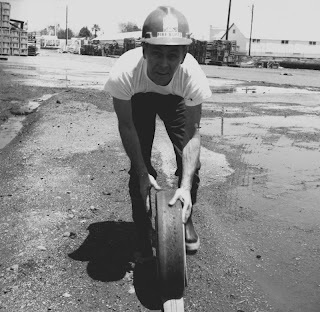 Bob is on a Glendale crash rig. Below is a picture of Bob (doing a Captain Morgan imitation) next to Engine 21 (same rig in the first pic of this post) on the day it was delivered. It had just been unloaded from the train it arrived on. Bob last attended a Fire Buffs meeting at what used to be old Station 18 in 1992. It is unknown if the association is still active. They are still listed at this site. 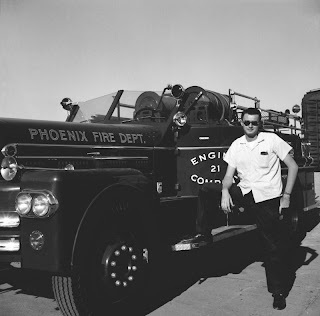 Between 1960 and sometime before the 1980's was the golden age of Fire Buffs in Phoenix. It is unfortunate that the Phoenix Fire Department is no longer as friendly to such organizations as it had been in the past. I would appreciate any information from the past or present in regards to the Fire buffs in Phoenix Arizona. They do not exist anymore.